Beginners welcomed! Kids and adults. Piano/keyboard, Clarinet, Saxophone, Flute, Oboe, Brass, Recorder, and more! All styles, all levels. 30/45/60 minute lessons available. Ages 3 to 6. 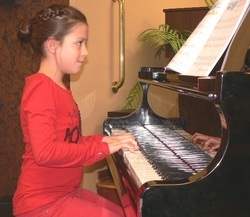 Piano, Violin, Guitar, Recorder private lessons. A FUN music program just for the young musician at heart who wants to play a real instrument and real music. We teach note reading and music terms through fun and age appropriate books (kids learn to be independent). 30, 45 or 60 minute lessons available. Don't see an instrument you're looking for, email us to see if we can help you. We also teach beginning strings, brass and percussion. During the summer months we help 5th graders prepare for 6th grade band/orchestra and help students switch into a new instrument for 7th grade band/orchestra. We can get you into band/orchestra easily with our summer music lesson program.